Much has been written and discussed about the outlook for science and engineering in the United States. If a recent event at the University of Notre Dame’s Stinson-Remick Hall is any indication, the future looks bright. The University’s Graduate Career Services office hosted the Indiana Automotive Consortium Road Show at Stinson-Remick in January. The road show featured representatives from Chrysler, Cummins, Honda, Mursix and Subaru showcasing employment opportunities within the state of Indiana for Notre Dame engineering students. 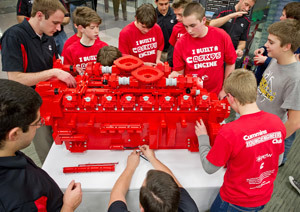 In conjunction with the event, the Cummins Young Engineers Club, which is designed to motivate and inspire pre-college students to excel in science, technology, engineering and math (STEM), sponsored a Lego replica build of one of its engines. During the event, Cummins engineers and Notre Dame engineering majors joined members of South Bend’s St. Matthew’s Middle School Robotics Club in constructing a four-foot-by-three-foot-by-two-foot replica of Cummins’ new high-horsepower diesel engine, called the QSK95. The replica engine was built with approximately 30,000 Lego bricks and was designed to help students and engineers share stories and experiences involved with becoming an engineer. The objective is for students learning about fundamental problem-solving and critical-thinking skills taught in STEM curriculum to use their understanding to build Lego modules that combine to create the replica engine. Each St. Matthew’s student was paired with Notre Dame engineering students, who were to provide guidance in assembling parts of the engine. Cummins engineers then directed the groups in assembling the engine as a whole. As the build progressed, however, it was difficult to decide who was leading and who was following. The St. Matthew’s students proved to be remarkably adept at quickly interpreting the build diagrams and assembling the component parts, with minimum guidance from their Notre Dame counterparts. Although the St. Matthew’s students taught their college counterparts lessons in Lego building, the Notre Dame students were able to pass on the excitement and rewards of engineering discovery, hopefully inspiring a new generation of engineers. Originally published by William G.Gilroy at newsinfo.nd.edu on February 21, 2013.